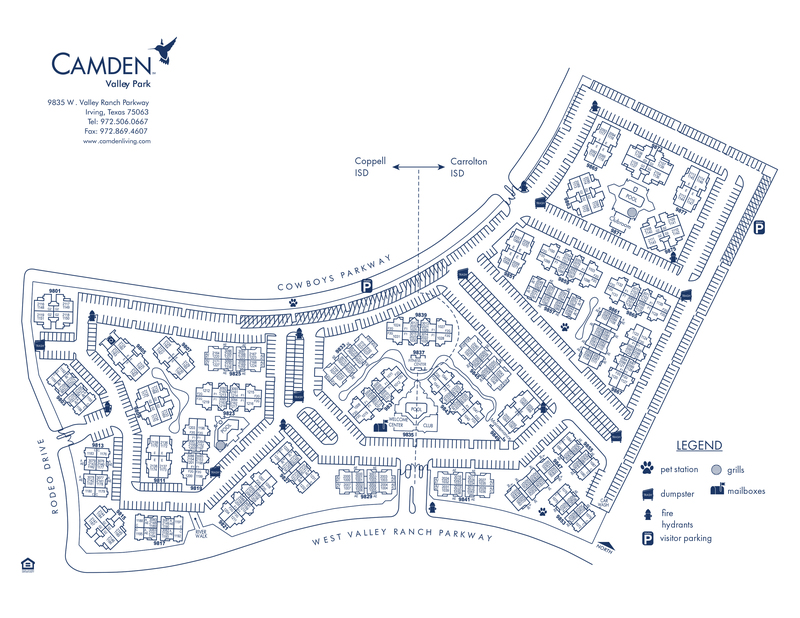 Camden Valley Park features one, two and three bedroom apartment homes located in the Valley Ranch neighborhood of Irving, TX near Las Colinas, TX. All of our beautiful apartment homes include black and stainless steel appliances, granite-style countertops, 9-foot ceilings with crown molding and hardwood-style and carpet flooring. Select apartment homes enjoy wood-burning fireplaces, private balconies and patios, and built-in bookshelves. Our community gives you the unique ability to choose between two school districts. Every apartment home at Camden Valley Park includes high-speed internet and WiFi, expanded cable TV and washer and dryer. Our pet-friendly community has three pools, a 24-hour fitness center and a business center with free WiFi. Love to plan parties? Right off the pool area our resident lounge provides a space for everyone to gather with a microwave and refrigerator. Step right outside your apartment and enjoy direct access to biking and jogging trails. Just a few minutes down the street, take your furry friend to enjoy the Waggin’ Tails Dog Park in Coppell. Living in Valley Ranch means that you are never far from the popular shopping and dining in Irving and Las Colinas. Your apartment home is within 15 minutes to both Love Field and DFW airports. The desirable location, fantastic community features, and award-winning school districts make Camden Valley Park the perfect place to call home. At Camden, your pets are family too! We welcome cats and dogs, up to two pets per apartment home, with a full-grown maximum weight limit of 80 pounds each. Call us with any pet-related questions! Pet Deposit: $300 per pet. Pet Fee(non-refundable): $250 per pet. Carports are available to rent for $15-$30 per month. Call us for details!